No one knew how popular the 9mm would be when it came out. 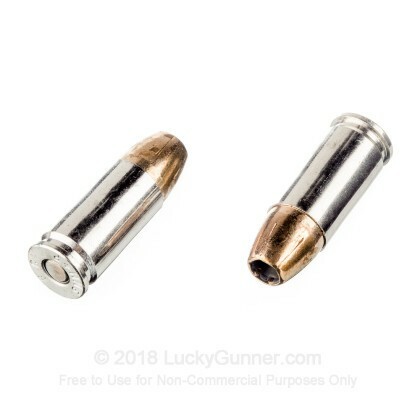 Created in 1902, the 9mm Luger is now one of the most popular rounds in the world and is one of the best rounds on the market for self defense. 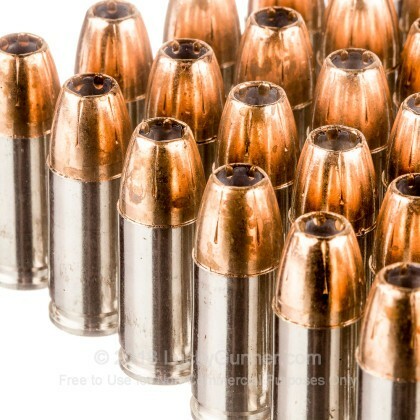 These 9mm rounds are loaded into premium nickel-plated brass casings that feature non-corrosive boxer primers. 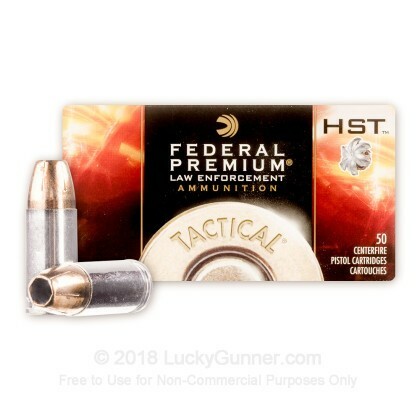 Each projectile in this box of 50 is a 124 grain HST jacketed hollow point leaves the barrel at 1,150 feet per second. 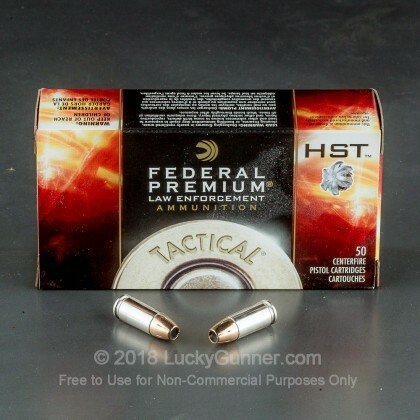 Federal's HST projectiles are engineered to deliver near 100% weight retention through most barriers, as well as consistent expansion, penetration and fantastic terminal performance. Federal Premium was founded twenty years after the 9mm came out, and has swept America with their fantastic quality and great prices. When you buy Federal Premium ammunition, you know you are getting high quality ammo that will perform every time you pull the trigger. Pick up a couple boxes of this premium self defense ammo today! In order to find out how different self-defense handgun loads perform, we decided to do some ballistics gelatin testing of our own. 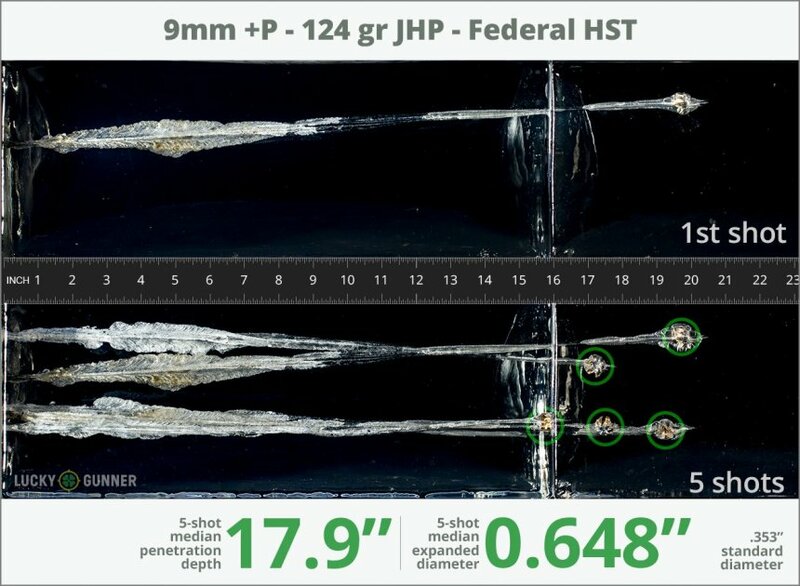 The chart below is a compilation of expansion and penetration data for Federal 124 gr HST +P fired from 10 feet, through four layers of fabric (to simulate clothing), using a Smith & Wesson M&P9c pistol. The photo slider provides a close-up view of the bullets we recovered from the gelatin, and the video shows this load entering the gel in extreme slow motion. The diagrams at the bottom of the page can give you an idea of how this load compares to other 9mm Luger (9x19) self-defense loads that we tested. We did a lot more of this ballistic gelatin testing, including over 100 different loads in a variety of calibers, so check out Lucky Gunner Labs for all the details. 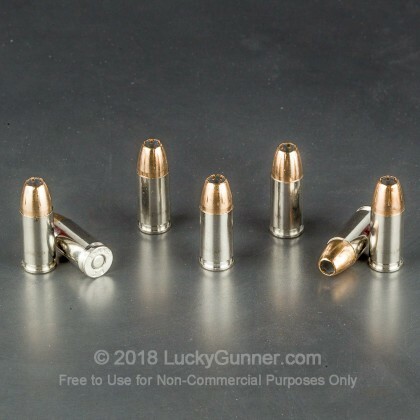 0.90" This ammo: 0.65" Min: 0.32" Median: 0.50" Max: 0.90"
17.9" 0" 5.6" 17.7" 47.5" This ammo: 17.9" Min: 5.6" Median: 17.7" Max: 47.5"
Fired a group of 7 out of a 3.3-inch barreled Springfield XDs today using sandbags and a green laser. Group size at 25 yards: 2.1 inches! Impressive. Thanks to Luckygunner for their ballistics review which helped me pick this round for testing. Federal Premium "Tactical" Law Enforcement loaded in my Glock 34 is carried daily. 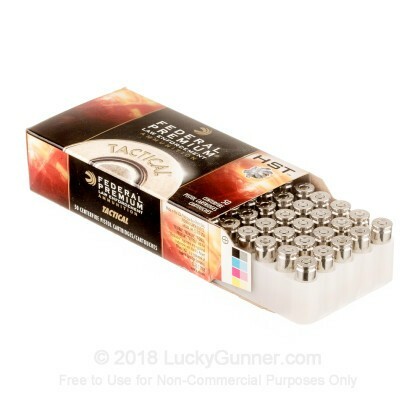 Very very accurate tactical high-velocity 9mm ammo. My favorite (: when needed it will deliver! Fantastic round. Have tested it and carried in Glock 19 and now Walther PPS. Feeds flawlessly, low flash and really mild recoil for a +p. 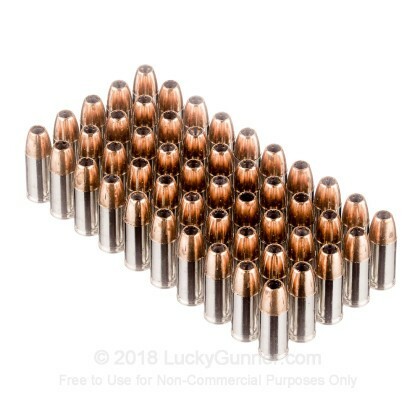 It's this type of 9mm ammo that allows you to carry a small defensive pistol with the performance of the "starts with a 4" group. Can be a little hard to find, but when you do, buy enough for testing, occasional practice and carry. 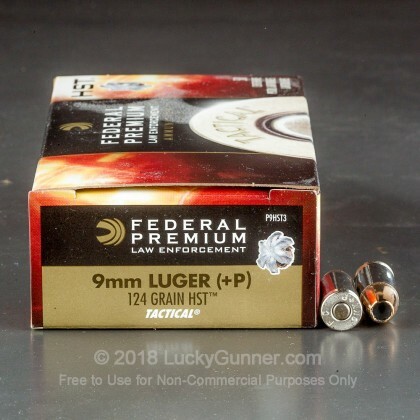 Q: Can this round be fired out of a ruger sr9c, and still get the same velocity as advertised? Posted On: 11/11/18 By: Jr.
A: Due to the different methods of testing for velocity from manufacturer to manufacturer, and depending on the barrel length of your handgun, the velocity is probably not going to match perfectly. There will be a variance between the two figures. However, the velocity should be close and consistent from round to round. Q: Is the bullet in this ammo bonded? A: This is not Bonded ammo. 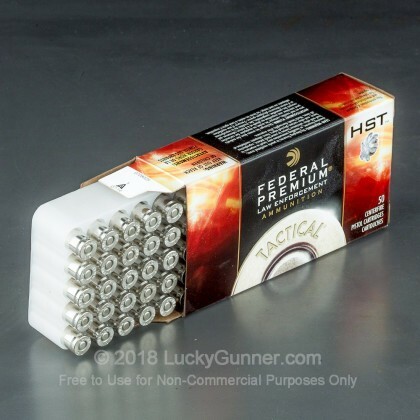 Despite not being so, the Federal HST has established itself as a top tier contender in the Self Defense ammo category. It provides very good performance, near 100% weight retention, reliability and all of this at a very budget friendly price. 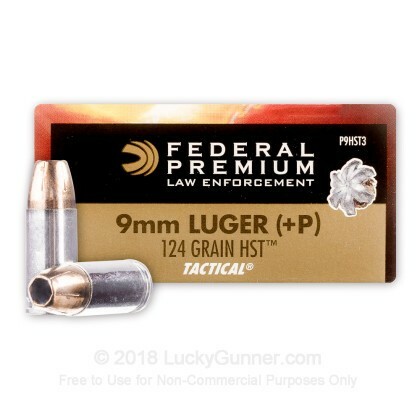 We also have this 9mm - +P 124 Grain JHP - Federal LE Tactical HST - 1000 Rounds ammo in stock in a bigger quantity.